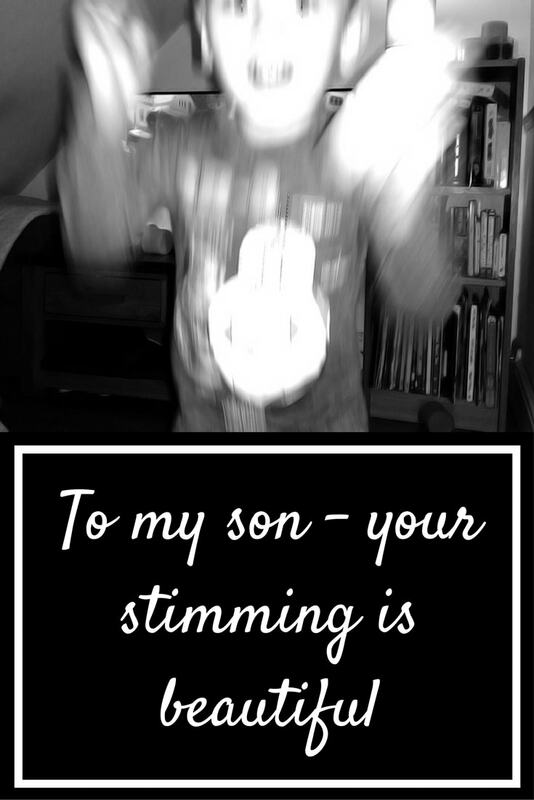 To my Son – Your stimming is beautiful. Your face contorts with emotion, mouth open, eyes wild. You raise your hands up towards your eyes, twisting finger between fingers, shaking your whole torso. This pose is held for a moment before you move, turning away, your legs carrying you off with a joyful little trot and you twist and flap your hands again. I know these movements. I know them like I know your face. They tell me how pleased you are with my praise. They tell me that your little body, your little heart, your little soul is filled with feelings and sensations too overwhelming for you – you cannot process them; they must find an outlet some other way. When you are happy, and overwhelmed with pleasure and amusement, it tells me that you love me, that I am doing something right. You raise your legs as you trot along, hands flapping, fingers twisting, mouth forming strange shapes in between your laughs and shouts. I know you are happy. When I first realised how much you do these actions, how much they consume you, I admit I was full of fear. They make you stand out. They make others stare. Your youth, at this moment in time, protects you. An inability to control emotions is so common in children of your age. Yet still, already there have been stares. Already, I have tried to make you stop, when I thought someone might see you and judge you unfairly. 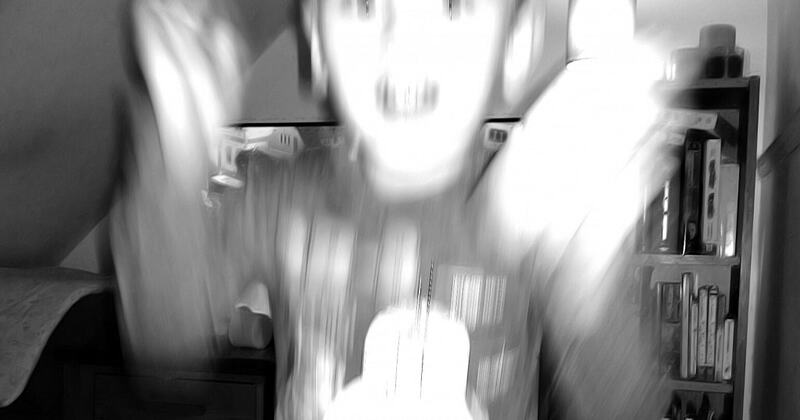 My gorgeous boy, now I see, stimming is like breathing to you – how could I possibly seek to stop you? Your breathing is my breathing, your comfort my own, your pain unequivocally mine. Sweetheart, although I know your stimming may make you seem strange, may make others point or laugh or wonder what is ‘wrong’ with you – I don’t want to take it away. To take it away is to take away part of you. I don’t want to change you; I want to change the world so that when you stim the world sees what I see: your passions, your love, your fears, your soul shining through – and you, all the parts of you, are beautiful. a lovely read (again! ), i used to work as a t.a. in a mainstream secondary and we were supposed to “train” our a.s.d. students out of their stimming “habbits”. i (and other colleagues) always felt uncomfortable about this. we could see that many behaviours were natural to them and in response to their emotions, feeling overwhemed or just unable to contain their joy/confusion/worry etc. it always felt a bit wrong to expect our autistic students to change to fit in with what’s “normal” when their own responses are so natural to them. yes it was the attitude of the school that they were just bad habbits that could be trained out of them that we felt uncomfortable with. a lot of us teaching assistants could see that it was more deep rooted than that. that working with the students to help them actually understand their emotions would be more beneficial to the students. our special needs dept was large and was split between two buildings. the overall senco was more hard lined but the manager of the other building was more understanding. i liked the days when i got to work in her part of the department. Thanks so much. It’s still a tough journey but finding joy in things like this is making it easier. Thanks for commenting. What a beautiful post. Whilst my big lad doesn’t flap he paces and repeats words or phrases like he will give you he Top 10 characters in Smash bros over and over. I must admit that I do sometimes say one last time please to him. But your post has helped me to see his from another perspective. Thank you! I find stimming so fascinating and spend hours watching and joining my boys with their stimming. Seeing how they’re so impulsive, uncontrollable, and figuring out what they mean in that moment. The sheer joy that they can get from rocking back and forth, tapping, or bouncing around means you can’t help but smile. Beautiful post, absolutely nailed it! Early on we feel like we have to force out children not to do these actions as it makes them stand out, makes people stare, and think they’re weird. We want to protect them, we don’t want to feel embarrassed, so we try to find other outlets, or even stop them Stimming. Then we learn, we start to accept, and we realise just how important Stimming is. Thank you so much. That really means a lot. Totally agree with this post. It’s an outlet for our autistic children, if it helps them to cope with a neurotypical life in which others don’t really understand, then so be it. I think everyone has some sort of coping mechanism, some are hidden as people grow up, some aren’t. Live and let live is what I tell me children, I wish people who are so quick to judge did the same. Great sentence from your boy too. Both our boys stim in different ways. Without it they would simply be out of balance with themselves. Love the post! Wonderfully passionate, such a well written post. I am just starting to see the stares from others. Thanks. Oh thank you so much. As a child, my stims were beaten out of me. Sort of. i still stimmed, just I had fear/pain/shame/guilt to go with it. When I was finally correctly diagnosed and started working on healing and growth, my autism doctor helped me let go of the trauma and paim, and now I stim freeling and when and where I need to do so. Apparently we all stim, even an awesome Mom like you. Just for those of us on the aitism spectrum, those stims are often more noticable, like flapping, or rocking or so many others. Those of us whom are adults in the Aitism community, call it #loudshands and embrace our stims as self regulation, expression and so much more in all the different forms they take. Including Echolallia (tepeatimg words or sounds that seem unrelated, but are avtually ver important) as a part of our lives, as a part of the richness of being ourselves. Thank you for embracing your son and his ways of being. You are awesome! THANK YOU for writing your blog, I wish I could copy everything you just wrote and put it on every wall in special needs schools in South Australia. We have a few awesome teachers, but some how we still have the ignorant teacher’s and support worker’s. I am now home schooling my daughter as I could no longer stand by and let my daughter be treated with no respect. Hopefully things change as I worry about the other children in her class who just get treated like naughty/annoying children who are not allowed to use there voice………..
You really give me hope that better things are coming, maybe not for my daughter and her peers, but hopefully when another 10 years pass special needs children will be treated with the respect they truly deserve. You are very welcome. Thanks for your kind words and such a thoughtful comment. What a beautifully written piece! The love for your son is heart warming. So much admiration for you and your lovely family. My son is currently going through the diagnosis for autism. I always get comments about how “with the fairies” he is and you know what? I wouldn’t change it for the world either.